Dutton Simulation provides Computer Aided Engineering (CAE) software for simulation of product performance and manufacturing processes. With our support, these software tools are used to create optimised designs at minimum cost, saving time and money in the product design and manufacturing cycle. We work in partnership with our clients to allow you to gain maximum benefit from the best value analysis and simulation software. Our services will benefit all involved in part design and manufacture, including designers, process & tooling engineers and manufacturers. Industries served include automotive, aerospace, white goods, electronics and all forms of precision engineering. Read how Honda of the UK Manufacturing have benefited from using FTI's COSTOPTIMIZER, achieving significant savings in both material and tooling costs. We supply sheet metal forming simulation software from the world's leading developers, notably Forming Suite from Forming Technologies Inc (FTI) ; and DYNAFORM, based on LS-DYNA, from Engineering Technology Associates (ETA). Our team has more than twenty years' experience in supplying and using these systems for metal forming analysis. 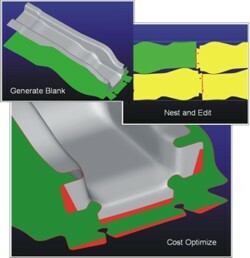 Complimenting our sheet metal forming simulation, Dutton now provide the roll forming design software PROFIL from UBECO. 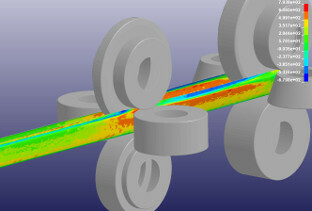 Section roll forming processes can be designed and analysed using a range of techniques up to and including FEA simulation using LS-DYNA. More details of these new products will be available on our updated website, to be launched later this year. To find out more, see the Latest News page for information on our latest software releases, forthcoming seminars and training courses.